Nancy clung to the base of a gas street lamp just across the street from St. Andrews shivering as she listened to the beautiful hymns and organ music late on Christmas Eve. The tiny child’s clothes were too thin to ward off the December chill and wind, and the cloth wrapped around the perforated soles of her shoes did nothing to keep out the snow. She couldn’t go back but no one else would take her. Papa had never come home from his sea voyage to America where he said he could earn a fortune for their poor family, and Mama had been beaten and murdered on the way home from cleaning the houses of rich folk, all for a few farthings. Auntie Pierce took in her baby brother Benjy but said she wanted no “dirty little girl” in her home and sent her away to her friend Lady Harrington to work with the maids. The maids said she was too small and weak and would be nothing but a nuisance, so sent her back to her Auntie’s. Auntie’s man servant refused her entry at the door and she found herself alone. A boy named Charley Bates discovered her begging on a street corner for just a few pence with which to buy bread and took her to Fagin with promises of work and pay. It was then she embarked on her new life as a thief. She had no wish to steal and had no talent as a cut purse. Nancy was only six-years-old and she prayed to Jesus every night that he would bring her someone who would love her and protect her so she could get away from that awful Fagin. She couldn’t go back to Fagin because she had nothing to bring him. How could she steal on the night baby Jesus was born? If only she could go into the church and pray, but she was nothing but a beggar girl and an orphan. Who would have pity on her and take her in except a miser and a scoundrel? Besides, she didn’t have a gift for the infant Christ. The man’s voice was behind her. She whirled quickly expecting a Constable and was ready to run. Instead she found herself peering at a dark looking man dressed in clean but common clothes. He had unusually long dark hair, curls pushing out hither and thither from under his hat, and his black beard was bushy and thick. He was smiling and stood a respectable distance away. He spoke English with a strange accent. The man looked into her glistening eyes as if they were the windows into her soul, as if he could see in an instant every day and night she had breathed and cried and dreamed in her short little life. Nancy desperately hoped the man would take pity on her and give her a small amount of coin. Then Fagin would shelter and feed her for another day and perhaps not beat her so badly this time. She was looking down as her tears one by one landed in the snow at her feet so she couldn’t see the remarkable look of compassion on the foreigner’s face or the fact that he was also crying. Now she was terrified. Sometimes Master Fagin would take boys or girls into his room and when they came out again, they were sobbing and complaining of where he had touched them. They all whispered about what happened to those children and Nancy was afraid that’s what this man wanted to do to her. She was so startled by such an outrageous statement that she hadn’t realized at first he was escorting her across the street toward the church, his hand very lightly touching her shoulder. Then she saw a man and woman, not in the clothes of the wealthy, but those of good, upstanding working folk, coming out of the church doors. “You mean Jesus?” She looked up and smiled for the first time. He looked at her and patted her shoulder but didn’t reply. “Mr. and Mrs. Barrows. It is so good to see you again.” He was jovial and greeted the couple with open arms. Strangely, Nancy now felt safe concealed behind the odd Gentleman. Nancy felt Mr. Abramson’s hand on her back ushering her forward in front of him. She felt instantly shy and yet for the first time in a long time, hopeful. “Nancy. I’m six years old.” She couldn’t think of anything else to say. Nancy looked up at Mr. Abramson as if he were someone she could trust, waiting for his approval. Miles also knelt down and the three hugged and cried together. “Yes Sir. Thank you, Sir.” Miles was waving now. “Yes, thank you, Mr. Abramson,” Helen added. The three of them ran up the stairs as the Christmas music reached a climax. They turned back for one last look, but their benefactor was nowhere in sight. Then they opened the doors and stepped into the house of God as a family. He bent down and, finding a robust and luscious red rose blooming in the cold, plucked it and held it to his nose, savoring the bouquet. 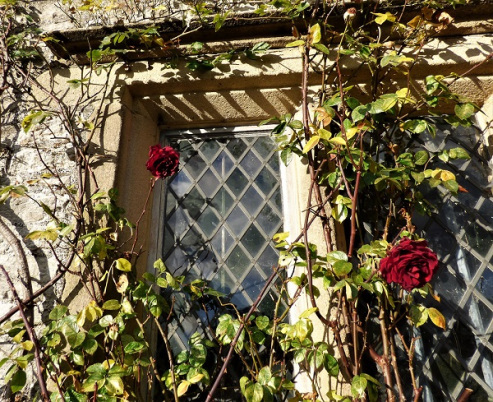 I wrote this for the Thursday photo prompt – Window #writephoto of 4 January 2018 hosted by Sue Vincent’s Daily Echo. The idea is to use the title and image presented as the inspiration for crafting a short story, poem, or some other creative piece. The image was called “winter rose,” so I chose to let that be my focus rather than the window (though I do mention the word “window” in my story). Commonly known as hellebores, the Eurasian genus Helleborus consists of approximately 20 species of herbaceous or evergreen perennial flowering plants in the family Ranunculaceae, within which it gave its name to the tribe of Helleboreae. The scientific name Helleborus derives from the Greek name for H. orientalis, helléboros, from elein “to injure” and “food”. Many species are poisonous. Despite names such as “winter rose”, “Christmas rose” and “Lenten rose”, hellebores are not closely related to the rose family (Rosaceae). I found a similar story at the Institute of Agriculture website for the University of Tennessee. I wasn’t interested in writing about the Biblical account of the birth of Christ, but I had an idea that included the character Fagin from Charles Dickens’s 1839 novel Oliver Twist. I checked and discovered that Dickens’s book A Christmas Carol was published just a few years later in 1843. I know, Christmas has come and gone, and I’m sure this very much seems like a Christmas story, but this is the direction in which the muse led me. I hope you have all guessed the identity of my mysterious Mr. Abramson. Jesus Christ (Yeshua HaMashiach) would have appeared as a middle eastern man, which means he would have had a dark complexion, dark hair on the longer side, and a large, black beard. I gave him an accent to accentuate his being a “foreigner,” and the last bit about December 25th not being his birthday, well it probably wasn’t. You can read more about that in my article Was He Born in a Sukkah?. I hope you enjoyed my wee tale. What a lovely tale, James, and wquite unexpected. I love that you have woven the folklore of the helleore through this tale too. Thanks, Sue. Glad you liked it. I liked the mash up of Dickens and Theology – makes for a fresh spin on an old story. We aim to please, Iain. Thanks. Ha. I see I’ve created a reputation for myself. I briefly considered writing a horror tale since the “winter rose” (which isn’t a rose at all) is poisonous and considered by some to be an ill omen. I chose the higher road for once. Great story. Very touching. I’m glad it worked out better for this Nancy than the other Nancy that Fagin took in! Thanks, Trent. The universe likes balance and so do I.
I enjoyed this very much. I’m a fan of Dickens. I liked that you had a happy ending for Nancy. I try to make happy endings for children whenever I can, Susan. Thanks. You’re welcome. It was a very good read. That was beautiful! I was in tears. I’m honored that my story touched you so. Thank you. Well, she had a rough time of it until the end, Jelli. I agree, though. Still, I have sent a whole bunch of children to live with dragons. That would be fun. Ahhhh, how well I know the dragons… fierce, nasty beasts. But, they do taste a bit like chicken when roasted over a fire. Not sure that would work so well with my dragons, Jelli. 😉 Besides, they are quite benevolent.